What are the key factors you should consider when assessing practice value? Profitability and appraisals are both important parts of the process and the following is a list of guidelines and topics to help guide your future research. Profits drive the value of a practice. They are the return on owning the practice and it is the return that is being purchased. The greater the return, the greater the value. Practices have appraised for anywhere from 110% to 15% of gross revenue. “Profits” are what you would get if you owned the practice only – meaning you don’t work there and you don’t own the real estate (i.e., fair market compensation for your veterinary work, fair market rent and clean financials). If a practice is financially healthy, it will have profitability in the range of 14-18% of revenues. If a practice is financially healthy (14-18% profitability) then it will probably have a value that will end up being between 55% to 80% of revenue. Asking what a practice will go for is like asking what the cost of surgery is; it is such a broad range that it’s tough to be accurate. 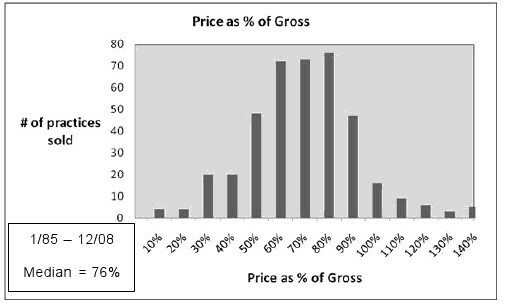 The recent average of a practice sold by Simmons has a value of roughly 72%, however, they’ve been sold in a range from 30% to 95% and there’s even one on the market now at 110% that will close this month (June 2011). The average practice these days has a profitability in the 8-11% range and thus is likely has a value that will end up being between 30% and 50% of gross revenues (if that). Practice values in general have been decreasing. There’s greater pressure on profitability: increased support staff costs, increasing benefit costs, higher-end pharmaceuticals that can’t be marked up as much, etc. The economy has also impacted values. If the practice was managing for revenues instead of profitability then typically the revenues *and* the profitability took a hit. Profits go down – so does the practice value. It is best to have your practice appraised every 3-5 years for management and planning purposes. If the value is low, the profits were low. If the profits are low it has to be a revenue and/or expense issue and we can help identify the problem(s). Fixing the profitability improves the practice’s cash flow, increases the practice profitability and its financial health, and increases the overall practice value. An appraisal is an opinion of value – and anyone can give you “an opinion”. These are big decisions. If you want a good opinion you need to know where it’s coming from and select a qualified veterinary appraiser. To assess a potential appraiser, request veterinary references and inquire about their experience level (particularly in the veterinary industry), accreditation and credentials (i.e. ASA, CBA, CVA, AVA, AIBA) with the understanding that they don’t guarantee competency, and compare their report to those prepared for you by previous appraisers to assess their report writing competence. Any decision on value should be defendable and is based on the appraiser’s judgment, the financial analysis, and the conditions in the market for that area (assuming here that the goal is fair market value). Free resources for estimating your practice profitability are available on the NCVEI.org website. Find the Profitability Estimator under the Benchmarking tools. It was developed by the Veterinary Valuation Resource Council (VVRC) and is free. It helps you go from the practice tax return to an estimate of your true practice profitability. This is a similar practice to what we do in the No Lo Workshops hosted by VVRC at the major conferences. What happens when you die? Will your heirs receive a fair price, or any price for your investment in the practice? Will they remain locked into that investment forever? Will your heirs collect profits from the practice? What if the other partner (who is getting paid under his practice employment contract) has voting control and decides not to distribute profits? If your heirs are to be bought out, who sets the purchase price? How and by whom is it paid? If part of the purchase price is paid with a promissory note, is same secured? How? What if the practice is not profitable enough to pay the note? What happens when your partner dies? Your deceased partner’s heirs are now your new partners. Barring a fluke, your new partners will not be veterinarians. Does your State permit non-veterinarian practice owners? Will they want to be bought out or stay and collect profits from the practice? (Without contributing to profit generation of course.) If the deceased partner was a large shareholder, or the majority interest holder, the heirs will also inherit your deceased partner’s voting rights. Do you want to share practice management with, or be managed by, such persons? What if the heirs squabble among themselves, leading to management paralysis and/or litigation? Do you fancy having the practice run by a court-appointed receiver? If the heirs are to be bought out, who determines the purchase price? How and by whom is it paid? If there’s a note, is it secured? How? What if you are permanently disabled? Will you receive a fair price, or any price for your investment in the practice? Will you remain locked into your investment forever? Will you collect profits from the practice? What if the remaining partner decides not to distribute profits? If you are to be bought out, who sets the purchase price? By whom and how is it paid? If there’s a note, is it secured? How? What if your partner is permanently disabled? Will your disabled partner want to be bought out or stay and collect practice profits (without generating any of same)? A disabled partner’s interests will be different then yours, so if he was the managing and/or majority partner, how will he run the practice? Will he be able to run the practice? What if the disabled partner is mentally disabled? If your disabled partner is to be bought out, who determines the purchase price? How and by whom is it paid? If there’s a note, is it secured? How? What if your partner goes nuts? You don’t want a mentally unstable person practicing veterinary medicine. But if such partner is the majority partner you can’t fire him, because he, not you, controls the practice entity. The same problem arises for equal partners. Sure your mentally disabled partner could voluntarily remove himself, but can you rely on that? What if the majority partner has a guardian? How will the guardian run the practice? What if the majority partner or guardian fires you? What if your partner should be fired as veterinarian-employee? Suppose your partner becomes lazy or his child becomes ill and decides to work significantly less hours or stop working altogether. Suppose your partner becomes a substance abuser and consequently unfit to practice veterinary medicine. Or he steals from the practice. Or he harasses employees and/or abuses clients and/or patients. The foregoing would be grounds for terminating a veterinarian employee. But if your partner is the majority or an equal partner you can’t fire him (as explained in the preceding paragraph). What if you no longer get along? Should the practice be dissolved? If not, who should leave? At what price should the departing partner be bought out? How and by whom is it paid? If there’s a note, is it secured? How? In a 50/50 practice how are disagreements handled? What happens when each party has equal voting/management rights and a serious disagreement arises? How will the resulting deadlock be resolved? What if your partner wants to drop out, buy a boat and sail around the world? Should your partner be permitted to withdraw? If not, how do you keep your partner from just resigning as an employee (in light of the constitutional prohibition of involuntary servitude)? What if your ex-partner discovers he’s chronically sea-sick and comes back to set up a veterinary practice next store (using the client list he kept when he left)? If a partner is permitted to withdraw, who determines the purchase price? By whom and how is it paid? If there’s a note, is it secured? How? What if your partner divorces? If the divorced spouse has, or is awarded, a portion of your partner’s practice equity interest, the divorced spouse becomes a partner. Ménages à trois make great literature and film themes but ALWAYS end badly. What if your partner goes bankrupt? Do you fancy your partner’s creditor as your new partner? It won’t be fun to have a bank running, or having a say in running, the practice. Worse, the bank likely will want to sell your partner’s share to a competitor. Who’s got the land? The small animal practice’s most valuable asset is its location, because most clients won’t travel far for pet treatment. As zoning restrictions get ever tighter, good practice locations become ever rarer (and more expensive). If, as is frequently the case, one partner owns the practice premises, what happens when he dies, is disabled, withdraws, resigns, divorces and/or goes bankrupt? What if another veterinarian wants to buy your partner’s interest in the practice? Should your partner be allowed to sell without your approval? Should you have a right of first offer? A right of first refusal? IF YOUR PARTNER IS NOT YOUR RETIREMENT PLAN, THEN WHO IS? If you don’t have a firm agreement with your partner to sell your practice interest to him (or someone else) upon your retirement, then how are you going to retire using your investment in the practice as your nest egg? What if both partners want to retire at the same time? Choosing the correct structure for your veterinary practice is an important decision with consequences reaching far into the future. Selecting your practice structure is definitely not a “do it yourself” project. Substantial tax, legal and accounting expertise is required. Veterinarians nevertheless need to stay active in the process to ensure the experts’ narrow technical proposals get folded into a coherent plan that reflects your needs and goals. It’s Mostly About Tax. Tax considerations are the primary drivers in choosing a legal structure for a veterinary practice. The two key aspects are taxation of income/profits and taxation upon the sale or transformation of the practice. Don’t paint yourself into a corner by choosing a business structure without establishing a succession or exit strategy. Exit strategies should focus not only on your richly deserved retirement, but also on contingencies such as death or disability). Since the transformation of an existing business structures in anticipation of a sale or the buy-in of a new partner usually triggers adverse tax consequences, it is usually better to choose an initial structure with the necessary flexibility to handle new arrivals, departures and divestitures at minimum fiscal cost. Liability Shield. In some structures such as partnerships, the owners are personally liable on their individual assets for the debts of the business. In others their personal assets generally are not at risk. Business structures, however, do not insulate veterinarians from liability arising from malpractice claims. But the shield works for almost all other claims, which in our litigious society are increasingly frequent. Unless you are an equine or food animal veterinarian, you generally have greater exposure to claims from your client’s “slipping and falling” in your hallway, than malpractice. Flexibility and Formalities. Some structures allow more management flexibility and/or are less burdensome to administer than others. Veterinarians generally tend to ignore formalities which is a serious mistake. Courts regularly have looked past the liability shield and held owners personally liable when the owners have failed to observe the formalities separating their personal affairs from those of the practice entity. The accompanying table compares the more common business structures from a liability, management and formality perspective (in simplified form). Following is a brief and much simplified overview of the tax characteristics of each entity. Sole Proprietorships. Since sole proprietorships are not legally separate from the single owner, there is no separate tax return. The practice’s profits are included in owner’s total income and are taxed at his ordinary income tax rate. In addition to federal and (if applicable) state income tax, the owner must also pay self-employment tax equivalent to the payroll taxes due as if the owner were an employee of the practice. Upon the sale of the sole proprietorship practice’s assets, the IRS will recapture all depreciation/amortization deductions taken by the owner/seller thereof and tax such amount at the seller’s ordinary income tax rates. In the unlikely event that any gain remains on the assets (after adding back any depreciation/amortization to their respective “bases”) they will be taxed at the lower 20% long term capital gains rate (assuming the relevant holding period is met). The buyer receives a “step-up” (increase) in his basis in the assets proportional to the amount of (purchase price allocated thereto) allowing him to re-depreciate/amortize them. Thus, asset sales usually are a better deal tax-wise for the buyer than for the seller, and all other things being equal, buyers will prefer to purchase assets rather than stock (in a C corp). Partnerships. Partnerships are “pass-through” or “flow-through” entities for tax purposes, meaning that each partner includes in his own taxable income the profits (or losses) of the partnership, which are taxed as ordinary income at the partner’s individual rate (much like the owner of a sole proprietorship). Note that each partner’s share of partnership income is taxable each year, whether such share was distributed to the partner or retained in the partnership. If the latter, then the partner may not have the cash to pay the tax. A consequence of the pass-through principle is that the sale of partnership interests are treated for tax purposes similarly to the sale of the underlying assets of the partnership (i.e., the assets are subject to depreciation recapture as in sole proprietorships). Corporations. All corporations must file separate tax returns. “S” Corporations. “S” corporations are corporations that elect to be taxed as a partnership. As “pass-through” entities, profits will be taxed in the hands of the shareholders whether distributed or not. An advantage of S corporations is that shareholders may take a portion of their profits as “S corporation profit,” free of payroll or self-employment tax (i.e., subject only to income tax). Profit corresponding to what the veterinarian shareholder would have earned as an employee is subject to payroll taxes in addition to income tax. (Sole proprietorships on the other hand must pay self-employment tax on all profits.) S corps are popular with veterinarians for this reason. “C” Corporations. “Plain vanilla” corporations (called “C” corporations to distinguish them from “S” corps) are not “pass-through” entities and are subject to corporate income tax, usually at the 35% rate for veterinary practices. Distributed profits (dividends) are taxed as ordinary income in the hands of the shareholders. This “double taxation” discourages the distribution of C corporation profits. On the plus side, C corp profits are not taxed until distributed, pension plan contributions are not subject to the S corp limits, and employee-shareholders’ health benefits are not taxed. Veterinarians wishing to maximize their benefits will choose a C corp over an S corp.
Limited Liability Companies. Limited Liability Companies are very quite tax-wise. Single member LLCs can elect to be taxed either as a C corp or a sole proprietorship. Multi-member LLCs can elect to be taxed either as a C Corp or a partnership. Unfortunately, not every state allows veterinarians for form LLC (ie, California). A Word Regarding Real Estate. If the practice owns its own real estate it’s better placed in a separate entity held by the owner(s) or held individually by the practices owner(s). This allows the owners to receive rent (which will be deductible from the practice’s income). Moreover, placing the real estate and the practice in the same legal entity frequently leads to problems because the buyer can’t afford to buy the real estate in addition to the practice. Choosing the correct business structure for your practice is important. Don’t treat it lightly. None. Just open your door and you’re in practice! (Created to provide more management flexibility than S Corp and “pass through” tax treatment ) Member not liable for debts/liabilities of LLC (subject to piercing corporate veil doctrine) Must file documents with state secretary of state; but management, profit sharing can be flexible. General Partnership Partners liable for debts/liabilities of Partnership; no liability shield Must file documents with state secretary of state, but management; profit sharing can be flexible. Salvation lies in adequate malpractice insurance. The basis of an asset is it’s original cost to the owner, as adjusted pursuant to IRS rules. Because veterinary practices usually are personal service corporations. Limited partnerships are different from general partnerships. An LLP generally is formed among several limited partners who are normally passive financial investors and one general partner responsible for managing the enterprise. Limited partners normally are not liable for the debts/liabilities of the LLP, whereas the general partner is. Contrary to the motion picture business, real estate or oil and gas exploration, LLPs may not be appropriate for a veterinary practice where all the members are actively engaged in the enterprise. Although mentoring is not a new concept in the workplace, modern partnerships are not necessarily like those in the past. According to HR Magazine, formal mentoring relationships in previous eras would have typically lasted at least a year. Informal ones? They could last a decade. In today’s workforce, though, these relationships are often shorter and more specialty-oriented than before. Because of this shortened timeframe and accelerated pace, lines between mentoring and coaching can be blurred. Increasingly, mentors are no longer necessarily higher on a company’s organizational chart. In fact, reverse-mentoring now exists. In reverse-mentoring situations, newer staff members are teaching older, more experienced ones about new technology, as just one example. As one scenario, a Millennial employee may be teaching her Baby Boomer supervisor about how to effectively use social media and crowdsourcing, while also sharing insights into new ways of thinking about business. According to a survey taken by the Association for Talent Development in 2017, 29 percent of organizations have a formal program in place for mentoring, with 37 percent of them having an informal one. Mentoring opportunities are also available through professional organizations, either online or in person. A skilled mentor can help the mentee become his or her best possible self. This happens when a mentor takes the time to really understand the person he or she is mentoring, including where the person is in a career path – and where he or she wants to go, career-wise. Once this is discerned, then each of the actions by the mentors should help the mentees participate in the types of behaviors that allow them to become aligned with their own best selves. Now, here are seven keys to creating the best possible mentor/mentee relationship. Key #1 Be very clear about the goals established for the mentoring program. Are there specific job-related skills that the mentee needs to gain? If so, what are they? Is the mentor guiding someone to an understanding of a practice’s culture? Perhaps the mentee worked for a private practice that was recently bought out by a corporate one, and the mentor is serving as a guide and sounding board to an employee during a transition period. Whatever the goals are, make sure they are clearly defined and understood by all involved parties. Key #2 Make sure the two participants are well matched. Synergy and mutual commitment fuel mentoring relationships, so it’s crucial to put the right pairs together. As mentioned above, mentoring is no longer limited to an older and/or more experienced person at the practice mentoring someone younger and/or newer. The goal of this evolving process is to have one member of the team fill in gaps of the skills and/or experiences of another employee, so form your pairings for that purpose. It can be tempting to put together people because they’re so much alike that they’re sure to get along. They probably will get along, but that alone doesn’t fulfill the purpose of mentoring. Remember: fill in experience and skillsets through mentoring opportunities at your practice. Key #3 Mentoring usually takes significant time and energy, so don’t expect quick results. There are exceptions to this rule, of course. If a Millennial is paired up with a Baby Boomer to teach the use of Instagram, this can all come together rapidly. If, though, that same Millennial is paired up with that same Baby Boomer to help transition the mentee to a telecommuting role at the practice, this can take time and energy for mindsets to evolve. Key #4 Multiple mentors sometimes make sense. Some companies pair up a mentee with a primary mentor and are then open to people having numerous more informal mentors to boost the diversity of the learning experience. It can be very helpful, even enlightening, to have mentors from different demographics – whether that’s age, gender or something else. Being exposed to different points of view from thoughtful members of the practice can be quite beneficial. Key #5 Mentors should provide guidance rather than setting strict requirements. Your practice will create an overall structure for its mentorship program and, yes, participants should follow the structure you set. But, a mentor is not there to enforce rules or to lecture. Rather, a quality mentor may spend more time asking questions and listening to answers than speaking, offering advice rather than rock-solid answers. Mentees should be encouraged to listen closely to what a mentor has to say and then carefully evaluate how it fits into his or her life and career path. Key #6 Mentees should prepare and ask questions. The best mentoring relationships are two-way streets, with the mentee being an active partner in the relationship. Passive listening will only go so far in helping a mentee develop skills and gain knowledge. Instead, engaged mentees should share what has been helpful, what gaps exist in his or her knowledge base and skill sets, and so forth. In a sense, being mentored should also empower the mentee to pass on knowledge to the next person in the practice who needs assistance. Key #7 Effective mentoring focuses on relationship development. Near the beginning of this article, we shared how modern mentoring resembles coaching, at least more so than in the past. But, at its core, mentoring has been and should remain relationship-oriented. The mentee should feel safe and nurtured as he or she learns professional skills through mentoring. Although this knowledge will likely enhance the mentee’s ability to perform tasks, mentoring is not as task-oriented as coaching. Mentoring should help employees at your practice become more self-confident and able to juggle his or her work/life balance. While coaching can be performance-driven, mentoring focuses on developing the employee, both to improve his or her skills and knowledge today and to prepare him or her better for the future. Be very clear about what you want to achieve through this program and have a plan in place to measure its effectiveness. Determine who can participate, both as mentors and as mentees. Can someone, for example, volunteer or will you select them? Decide how formal or informal the program will be, how often you expect partners to meet and so forth. Explain the program to your team, adding specifics to the employee manual, and strategically pair up mentors and mentees. Invest enough resources to allow the program to be successful, be available to mentors if they need guidance, and use this program to develop your team in a way that dovetails with practice goals and dreams. When you’re new to the workforce, supervisors are typically older than you are, and that just feels like the way the world works. As time passes, though, you may find yourself in a situation where you are older than your boss. In fact, a Harris Interactive survey conducted on behalf of CareerBuilder found that almost four in every ten employees in the United States are now working for a younger boss. And, as increasing numbers of people from the Baby Boomer generation decide it’s time to retire, that dynamic is going to become even more typical. If you find yourself in that situation, and it’s uncomfortable, what do you do? Here are six tips. Tip #1 Is It Really Uncomfortable? The bottom line is that you may be framing your situation as more difficult than it really is. If that seems possible, pause, and really consider your boss and your situation. No perfect boss exists. Is your situation genuinely uncomfortable? If it isn’t, your problem is solved! If it is, tip number two may help. Tip #2 Why Are You Uncomfortable? If your discomfort is real, try to decipher why. Do you want to be in a supervisory position yourself? If so, what do you need to do to help make that happen? Or, do you not want a supervisory position, but your ego is bruised because someone younger is higher on your company’s hierarchy? If that’s the case, remind yourself that you don’t want this type of promotion and focus on finding satisfaction in your own job. Compare your levels of discomfort. If you had the same degree of unease with a boss of an age similar to yours or with one older than you, would you feel this uncomfortable? If having a younger boss makes you more uncomfortable, it may be that this generation performs tasks somewhat differently from you. If that rings true, tip three can help. Here’s a litmus test. If you find yourself saying, “But we’ve always [fill in the blank},” stop. Reassess. It’s only natural to get comfortable performing tasks in a way you’re used to, no matter what age you are. But, it’s highly beneficial (again, no matter your age) to continue to embrace positive change. When you’re able to maintain this attitude, you’ll continue to learn and grow, and this will provide you with opportunities to appreciate the good changes your boss is implementing. If a new technology, process or philosophy feels too strange, try listing positive aspects of it and see if you can focus on them instead of how new and different these changes feel. And, number four can help when interacting with anyone new. Do you and your boss share a true passion for companion animals? If so, then find ways to bond together on that common interest. Also look for other ones, whether work-related or outside the scope of work. You may discover that you both volunteer for the same or similar causes, perhaps a local animal shelter, a service club or a hospice center; have traveled to some of the same fascinating places; or root for the same sports teams. It’s unlikely you’ll spend significant time discussing outside interests during a busy day at the practice, but they can serve as a wonderful wellspring of bonding and allow you to view your boss in a whole new light. Despite commonalities you discover, you may also decide that, yes. There are genuine issues that need addressed with your boss. A face-to-face conversation may clear the air, but be prepared to communicate your concerns clearly, without being defensive. Perhaps, for example, you’ve always prepared written reports for company meetings, but now your Millennial boss wants succinct bullet-pointed PowerPoint presentations to share. If you feel, for example, that some information that had existed in your more in-depth reports is now missing or not given enough context, explain that concern and offer solutions. Maybe the PowerPoint slides, in your opinion, would work well but need more detail to share important information. It’s also possible that your younger boss is using technology that’s new to you, or you aren’t as familiar as you’d like to be with its capabilities and use. If so, then the solution could be to get more training with this technology, either by doing so on your own or through resources offered at work. If you’ve worked at a practice for a significant amount of time, or if you’ve been in the veterinary industry for any length of time, you’ve gained valuable experience and knowledge. And, it makes sense for everyone at a practice to pool knowledge to provide the best experience for clients and their companion animals, and to run the practice as effectively as possible. But, be careful that you don’t lecture or say anything that could reasonably be construed as condescending. Instead, understand what challenges your boss faces and empathetically reason through potential solutions. Share ideas in a way that makes your boss’s work life easier and maintain an attitude of teamwork to create the most productive working environment possible.